This needs to be said. 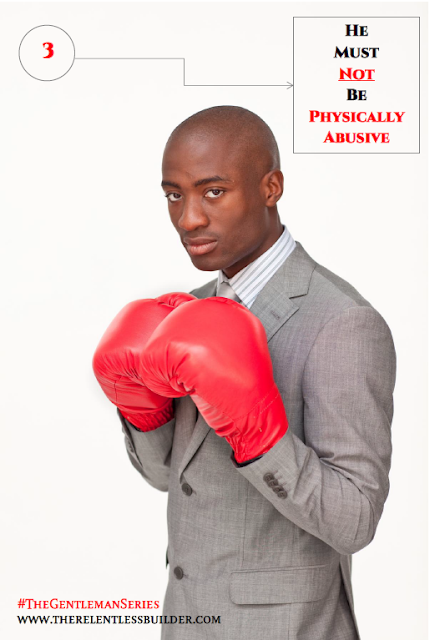 I am anti-physical abuse, before, during, and even after a marriage. It is simply thuggish, bully behavior that should not be tolerated. Besides which, you cannot put the words "gentleman" and "physical abuse" together. It is contradictory. I took a Domestic Violence class in law school. Funny enough, it was grouped under 'Family law.' I guess that's because many instances of abuse take place within a family setting. Back to my Domestic Violence class. One of the things we learnt was that a typical abuser has a charming personality. In public. That is, if we look at our series, he is polite, and well-groomed. In short, an attractive and very desirable man. But at home, he is a lion. In a bad way. A man who beats a woman is a thug, an agbero, a riff-raff, an animal. He belongs in a zoo. A typical Nigerian man believes that no woman should talk to him "anyhow." And if a woman crosses that line, he can slap her or do worse. That is total nonsense. While I do not condone rudeness from men or women, I believe there are valid ways to make your point without physically abusing another person. A gentleman, a true gentleman would never ever hit a woman. Period. The same applies to Nigerian gentlemen. Now, for those who say women should watch their tongues or that women somehow "bring" the abuse on themselves or somehow provoke men to abuse them, let me ask you this: If you are at work, and your boss is rude to you (male or female) and your boss treats you or talks to you "anyhow" why not slap or punch your boss? I mean, it is a means of self-expression right? You would NEVER do that because you stand to lose something: your job. For the sake of that pay check, you will endure the insults, etc from your boss. So why would you not extend the same principle to your wife, girlfriend, fiancee, sister, mother? In short, the women in your life. Because you consider yourself to be bigger, better and more powerful than them. The reason why a man would hit his wife at home and not react the same way to his boss (or co-workers, sometimes) is because he does not consider her his equal. He has no respect for her and does not value her as a person. Even if you grew up witnessing your father abuse your mother, you don't have to follow in his footsteps. As an adult, you should know the difference between right and wrong. While we can never choose the family we are born into, we can definitely choose the family we will have. I'll stop here. My point again is this: The quintessential Nigerian gentleman would never resort to physical violence to make a point. Especially not with a woman. Question: Is physical abuse an accepted part of Nigerian culture? Should a man physically abuse a woman (or vice-versa) under any circumstances? I think physical abuse is accepted in not just the Nigerian culture but in Africa as a whole and in many other cultures too. In the African culture, I think this is partly because women are taught to endure and 'manage' their marriages. Divorce is rarely, if ever, an option. I think it also happens a lot more than we realise because not many people would admit that they are being abused, and most women tend to cover for their husbands. I agree with all the points you made, but I think the issue of physical violence in relationships is a lot more complex than may seem at first glance. For example, it's easy to say to a woman that is being abused to pack her bags and get out, but this might not be very easy for the woman to do, for example, if she has kids, or is fully dependent on her husband for her upkeep (unfortunately, we don't have many 'safe houses' that women can go to in such situations). There is also the emotional attachment to the relationship that is not easy to let go of. I could go on and on, but it's also worth mentioning that there is emotional abuse, which sometimes accompanies physical abuse, and also important is the fact that men do get abused too! Abuse of any kind; physical, verbal, emotional is not acceptable. The end. Jemima: You're right, especially on the emotional abuse. That one is more common, but doesn't get as much publicity because it goes undetected. I mean, how do you tell if a person is being emotionally abused? Toin: Yup! That's a strong statement. Point taken! I think here in the US, there are ways to help battered women, but in Nigeria, where does such a woman go to for help? Her parents will likely say they have no place for her. Are there even shelters for them? And then, there's the big issue of economic dependence, like you noted. If she is dependent on her husband for money, then how can she leave? I think the Church needs to step in and stop turning a blind eye or telling these women to go back home as if nothing happened. Victor: Well said! Physical abuse should not be tolerated. But it is. I love the scripture you used. I didn't quite see it this way. "As long as it depends on you ..." Food for thought. Thanks for the household chores suggestion. I'll definitely consider it, but I think you already know what I'm going to say. 50-50! Nollywood Reinvented: Thank you for sharing that story here. I actually read it when it was still fresh and was just infuriated. There are times for words, and there are times for action. When a woman reports that she is being abused in her home, words alone are not enough. That is the time for action, and the Pastor did not do it. And then, she died at her husband's hands. Ridiculous! I feel like the Church has a role to play in this because Pastors and spiritual leaders are usually the ones (apart from friends and relatives) that battered men or women run to during these episodes. I'm glad Stella is helping to create awareness.